A green and cosmopolitan city, Singapore is best known for its picture-perfect skyline and its bustling super-clean city centre. Made up of not just one island but 63, Singapore is both a city and a country, and is affectionately known as the ‘City in a Garden’. 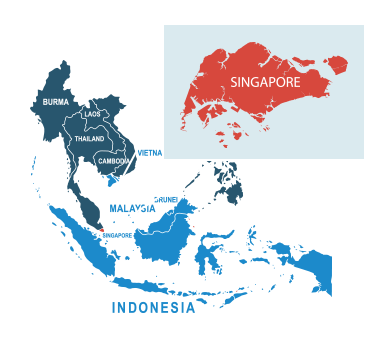 When it comes to shipping to Singapore, there’s no better option than DPD Local Online. With our extensive experience of international courier delivery, you can be certain that your parcel delivery to Singapore will go as smoothly as possible. With a range of express and economy courier delivery services available, you can arrange your parcel delivery to Singapore at a price that suits your budget with no loss of service. You can trust that arranging your postage to Singapore with DPD Local Online means that your parcels will be delivered quicker and safer than they would with another parcel courier. To arrange your shipping to Singapore in the best possible way, just complete our easy-to-use online form and we’ll take it from there. Do I need to deal with customs when sending from the UK to Singapore? Since it’s an independent international state, posting to Singapore from the UK will require a customs declaration to be legally sound. Sound confusing? Not to worry, because at DPDLocal-Online, we’ll send you over all the correct customs documents you need to ensure that your package gets to A to B with no interruptions. How much does it cost to send a parcel from the UK to Singapore? When you book with DPDLocal-Online, postage to Singapore costs as little as £26.47. We won’t be beaten on our outstanding prices on international parcel delivery, because we strive to offer you the best possible deal. How should I address my parcel for delivery to Singapore? Generally, addressing a parcel to Singapore is fairly straightforward, following the same rules as UK addresses, although with a numeric ZIP code next to the city name. For all the details you need, the Universal Postal Union has put together a handy addressing guide for Singapore that you can refer to. Singapore has some fairly stern restrictions on certain brands of alcohol and cigarettes, and those that aren’t banned still incur a hefty import tax. Also, any cigarettes with the prefix “E” written on the packet won’t be admitted into the country. It’s best practice to contact Singapore customs for some expert advice on importing into Singapore, since legislation is prone to change at short notice. For a rundown of items not allowed in UK mail, see our handy prohibited items list.